A software defined radio is a radio transmitter/receiver that uses digital signal processing (DSP) for coding/decoding and modulation/demodulation. This allows much more power and flexibility when choosing and designing modulation and coding techniques. This project will implement a Digital Software radio receiver with a TI C6700 series of digital signal processor. Due to hardware availability, both the transmitter and receiver will be implemented on the same DSP evaluation board. The system will be constructed and programmed entirely in Simulink using the embedded target for TI C6000 Simulink library. See deliverables for more information. Using the SRadio Test IN block as the input to the QAM transmitter and receiver system shown in Figure 1, we verified that the data into the system is successfully received on the output. This data is shown in Figure 2. The delay in the data shown in the bottom graph of Figure 2 is due to buffering and unbuffering data. While the test blocks for the DSP board were being developed, work was also being done on integrating the OFDM and QAM designs. Figure 1 shows the overall block diagram for the complete radio. This radio design does not take into account synchronization. The test data comes from the “Sradio Test IN” block. This block, is the test interface that was developed earlier. It will output data blocks in a 256 byte column arrary. When run in Simulink, the block outputs an initial frame of all zeros then a frame containing the string “Test string.” padded by zeros up to the 256 fame size, and then zeros until the simulation is stopped. The frames are output once per second. The data then gets QAM encoded, OFDM modulated, interpolated and mixed to a higher frequency of 131.072 KHz. After this it is sent through a channel model (which has no effect for now), demodulated, decimated, OFDM demodulated, QAM decoded and then saved to the Matlab workspace where it can be examined. This design has many different sampling rates which needed to be tracked carefully to ensure a working simulation. In the QAM modulation block, each byte of the ASCII data gets separated into groups of two bits. Each bit is then mapped onto a 4 level QAM constellation shown in figure 2. This constellation was chosen to ease decoding. The MSB is 0 when the real part is negative and 1 when the real part is positive. The LSB is 0 when the imaginary part is negative and 1 when positive. 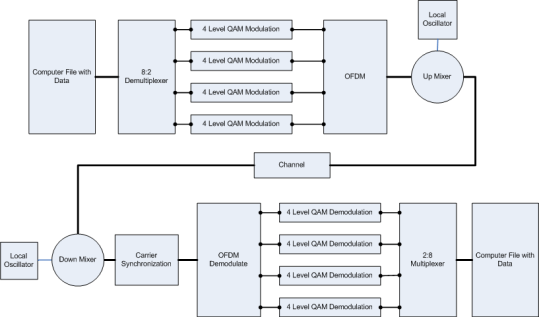 The QAM data stream needs to be mapped to appropiate OFDM subcarriers. A 64 point IFFT/FFT was chosen for this project because that is what is used in the 802.11a standard. Figure 3 shows the OFDM subcarriers as given by the 802.11a standard. The subcarrier at 0 or DC is not used so problems with the RF circuitry and ADCs will not occur. Eleven subcarriers are not used on either end of the spectrum to make it practical to filter when upsampling. Pilots are also inserted at carriers -21,-7, 7, and 21 to help with synchronization. Since just 4 QAM symbols are being transmitted at once, only carriers 1,2,3, and 4 will be used at this time. This is shown in figure 4. We are going to be using a phased locked loop for the carrier recovery in the Software radio. Much of this information was researched in "Telecommunication Breakdown" by C. Richard Johnson Jr. To properly recover the carrier, two unknown parameters need to be determined. These are the carrier frequency and phase. Johnson describes how the carrier frequency and phase can be recovered using either a cascaded phased locked loop or a single phased locked loop with a higher order fileter inside a single PLL. If properly chosen, it was indicated that this PLL can track modest frequency and phase changes. The choice for this filter is supposed to be detailed in the document Analysis of the Phased Locked Loop in the CD that came with the book. In the document Analysis of the Phased Locked Loop proof that the PLL converges when simplified linearly. However, there was little discussion of filter choice for a single PLL that tracks both phase and frequency. A descrete phased lock loop was created out of signal processing blocks in simulink and see how it reacted to modest changes in frequency and phase. The following test plots in Simulink verify the design. The two top graphs in figure 1 are the input and output of the PLL respectively. The bottom graph is the input to the VCO. This is consistant with the behavior of a locked PLL. When the frequency difference is increased to 1 Hz. One hertz is evidentally beyond the capture range for the PLL. More studying will have to be made to determine how the gain block, filter gain, and VCO sensitivity affect the hold-in and capture range of the VCO. Now that the Matlab testing interface was verified using the testing program, the next step is to design the testing software for the DSP side of the board. The testing software for the DSP board has 3 parts; initialization, data receiving, and data sending. The DSP board timer controls the execution of the Software Radio processing. The timer is disabled when waiting to receive, receiving, and sending data because there is no software radio data processing that needs to be done at these locations. Also, the simulink program is set to abort on an “overrun.” Although this is supposed to be able to be disabled from the “Configuration Parameters” dialog in Simulink. To test the testing interface, the following simulink block diagram program was created. This is the output of the matlab program. Since the same data coming out is what is going in, the program is working successfully. Now that the receive RTDX blocks in Simulink are verified to work and experience has been gained in working with RTDX, Matlab, and Code Composer Studio, we need to design a test system that will verify that the Software radio parts are working as intended on the board. The first thing that needs developed when doing this is a block diagram of the radio. This is shown in Figure 1. The Matlab program will act as the bridge between the user and the DSP board. It will take the user’s “message”, convert the message into a binary stream, transmit it to the DSP board, and indicate to the DSP board that the data is ready to be sent through the radio. On the receive side, the Matlab program will do the opposite. It will wait until DSP indicates that the radio is done processing the data, receive this data into Matlab, and then convert it back into the form of the original message. On the DSP side, two simulink blocks/sections of C code will interface the RTDX to the software radio designed in simulink. The Input interface block waits until the data has been sent by the Matlab program, the data is put in a convenient location for the Simulink program to process and indicate to the radio that it has data to process. After this, the radio will process the data. The output interface block will stop the radio when its buffer is full and indicate to the Matlab program that the processing has been completed, and transmit the data back into Matlab. To test the interface, a program will be developed to run on the DSP board. A simple echo program was designed in C to echo back whatever string came in the input of the DSP board. The code from this program will later be used to implement the testing blocks in simulink. A flow chart for this program can be found in figure 2. The RTDX interface in Simulink was investigated to verify the transfer of data to and from the DSP board when testing the software radio. RTDX is a way to programmatically send and receive data to and from the TI 6713DSK board through code composer studio. Although the interface will not work in a production environment, it is an excellent way to send data to the DSK board for testing. The “From RTDX” block receives data from the host PC and transmits that data to the DSK board. The “To RTDX” block transmits data from the DSK board to the Host PC. As a starting point for testing, the model in figure 2 was created. The model counts from 0 – 15, incrementing every 1 second and transmits this to the RTDX channel. This value is also sent to the LEDs so that there is a visual indicator on the board that it is still running the program. Communication on the host side was programmed in Matlab. The Code Composer Studio link for Matlab provides functions for interfacing with RTDX. 2. Open the specific RTDX channel. 3. Enable the specific RTDX channel. Once this takes place, the board will begin to transmit the data to code composer studio. When the connection is not enabled, the messages are lost. The message is then read with the readmsg function. After the data is taken in, the channel is then disabled, closed, and rtdx itself is disabled. The transmitter portion of the system block diagram is almost correct. The level of each block is not quite the same but it shows the dataflow through the system. Pulse shaping, if anything, could be added before the QAM modulator to make better use of the bandwidth of each channel. The need for this will depend on the implementation of OFDM and needs to be researched. The transmitter needs a couple of additions, depending on the amount of corruption that is used in the channel model. Initially we should have complete control over the channel model used. A complete model would add a varible gain/attenuation, delay due to the channel, multipath interference, and interference from other sources. Once an ideal transmitter/receiver is working, these interferences will be added one at a time. The most important interference is the delay of the signal. Delaying the transmitted signal will make synchronization necessary in the receiver. This is a major part of the project. The block diagram already shows carrier synchronization. This will align the phase and frequency of the transmitter and receiver. However, there are two additional forms of synchronization that need to be considered. These are symbol synchronization and frame synchronization. Symbol synchronization is sampling each pulse at the right moment to ensure the data is extracted from the pulse most accurately. This will extract the 1s and 0s out of the stream. Frame synchronization is knowing when the messages stops and ends in these 1s and 0s. This is important because an offset of just one bit will throw the whole message off. This could be implemented by looking for a known sequence, but there are issues that need to be considered with this also. After the project works with the channel model in place with all the necessary corruption models, it can be replaced with running the signal out through the D/A converter and back in through the D/A converter. Various corruptions can be done between the D/A and A/D converters, eventually targeting radio frequency circuitry and possibly an antenna. 2. Design and simulate an ideal transmitter/receiver pair (no channel corruption) and implement on DSP board. 3. Add delay to the channel model and get the 3 levels of synchronization working in simulation. Implement on DSP board. 4. Add other channel corruptions (gain/attenuation and multipath). Verify operation of radio in simulation and on DSP. 5. Remove channel model and run signal through D/A and A/D. Verify operation of radio on DSP board. 6. Introduce interference to physical signal and verify operation. 7. Procure RF circuitry and look into actual wireless transmission. This is the first post for the project log. More will come here about the week's progress and activities. Plans for future weeks and such will also be made here.